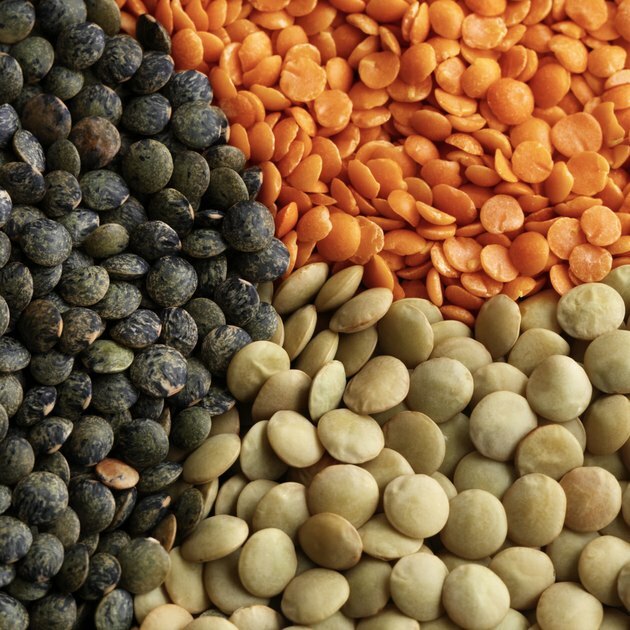 Lentils fall into the beans and peas group, which means they can be counted toward either your recommended vegetable consumption or your recommended protein consumption for the day. The U.S. Department of Agriculture recommends everyone age 14 and older eat at least 1 1/2 cups of beans, peas or lentils per week as part of a healthy diet. A serving of cooked vegetables or starchy carbohydrates, such as lentils, is typically half a cup. This serving contains 115 calories and would count as half of a cup of vegetables toward the 2 1/2 to 3 cups recommended per day for adults. It is also equivalent to 2 ounces of protein, toward the recommended 5 to 6 1/2 ounces per day. The USDA recommends counting lentils as a protein food if you haven't met your minimum recommended protein intake for the day and as a vegetable if you have already consumed enough protein. Are Lentils OK for a Low Carb Lunch for Someone With Diabetes?